Rising freshmen hear about how technology will be integrated into their learning, as well as thei role of their personal devices in the classroom. This is the first year that Convent & Stuart Hall will be using a Bring Your Own Device Program instead of leasing iPads to students. The first day of Freshman Success, Convent & Stuart Hall’s freshman orientation program, saw 51 freshman boys experience their first two days at Stuart Hall on Monday and Tuesday. “[Monday] was fun, it was something knew and an overall good and exciting experience,” said Matthew Howard ’20. It is the first day that each rising freshman gets to interact with their new classmates in the school environment as well as meet faculty and current students. Admissions Director Shuja Khan and Student Council executives led an icebreaker in the morning which was followed by a barbeque that was also put on by the Student Council executives. After lunch, the Class of 2020 asked about the homework load during freshmen year, pressures from inside and outside the classroom as well as keys to a successful first year, during a Q&A session with 10 seniors. “The panel answered a lot of questions and gave good advice to help me start my experience off right,” George Albert ’20 said. 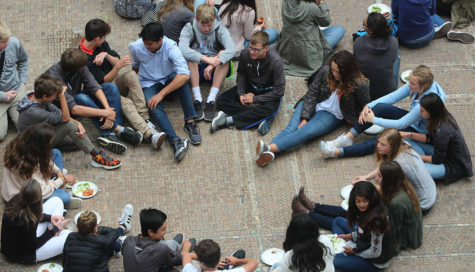 Convent & Stuart Hall freshmen have lunch together on Tuesday. This was the first co-ed activity of the school year for the Class of 2020. Presentations addressed opportunities in clubs and athletics, Sacred Heart heritage remarks from Head of School Tony Farrell before heading home with their first day of high school completed. Tuesday heavily focused on getting students prepared for their first day of classes. The Class of 2020 met and had breakfast with the seniors before learning how to connect their devices to the internet. The boys met their advisers and walked to the Broadway campus, where they had their first lunch with the Convent freshmen. Together they walked back to the Pine and Octavia campus and wrote letters to children in Uganda. After the girls returned to their campus, a capella director Scott Roos led the boys in the singing of the Coeur de Jesús, the anthem for Network of Sacred Heart schools.